The five star Annabelle is the ideal place for the seeker of sophistication and beauty. This elegant and luxurious hotel, situated on the beach overlooking the picturesque fishing harbour and ancient fort of Paphos, has been designed with great care and attention - and it shows. From the moment you enter the fabulously designed lobby with breathtaking views to the sea, the mood is set for a wonderful, unforgettable experience. The Annabelle's fine and sensitive interior is supplemented by its impressive tropical gardens, cascading waterfalls, swim-in grotto, main swimming pools and spacious sundecks overlooking a decorative pond and a classical amphitheatre. The Annabelle's luxurious rooms, suites and garden suites are tastefully furnished and fitted with the most up to date facilities such as hair dryers, mini-bars, radio, satellite television and international direct dial telephones. The Andromeda Health and Beauty Centre is the perfect sanctuary for your body and mind. It has a sauna, Jacuzzi, steam bath and state-of-the-art gymnasium with a trainer. There is expert staff for massage, aromatherapy, physiotherapy and Japanese relaxation methods as well as a beautician and a hairdresser. We also offer a tennis, a squash court, a games room and a complete sea sport centre. During the summer season, the guests can enjoy a full day champagne sunset cruise to the beautiful Akamas National Park, aboard a luxury yacht.The Annabelle excels in the quality and variety of its cuisine. Fresh products, inspired menus and acclaimed chefs ensure that each of the four restaurants provides a unique culinary experience. The hotel's impressive wine list offers everything from the delicate regional wines of Cyprus, to the finest international vintages. With its intimate candlelit tables looking down over delightful illuminated water gardens, The Asteras restaurant offers an innovative fusion gastronomic experience. The Amorosa entices with a menu of contemporary continental cuisine, while The Fontana offers a choice of buffet or ?? la carte dishes in a relaxed, family atmosphere. Not to be missed is the Mediterraneo Restaurant where Executive chef Polycarpos Demetriou prepares traditional Mediterranean Cypriot dishes. 'Food from the Village', a cook book, compiled by the acclaimed writer and broadcaster Thane Prince containing recipes for many of these Mediterranean classics is available.There is also a wide selection of bars including the "Grotto Bar" (wet bar) for thirst quenching cocktails, the "Pool Bar" for light snacks, and the "Lobby Bar" for morning bakery items and afternoon tea with delicious cakes. The "Byzantine Bar" has live music to dance the evening away. All this and the warmth and care of its staff make The Annabelle the ideal place for those seeking a relaxing holiday in an exclusive environment away from the crowd. All the guest rooms at The Annabelle feature the following facilities: Balcony, air-conditioning, satellite television, radio, international direct dial telephone, mini-bar, hairdryer, bathrobes and 24-hour room service. Side Sea View Rooms - These rooms have a side sea view room overlooking the gardens and/or swimming pool and some may take a third bed. Situated either on the ground or first floor of the hotel these bright and airy suites have direct view to the sea and consist of one bedroom and living room in open plan style, plus the bathroom, and in some of them a walk-in shower. The same type of room is also available with the added luxury of a private pool at an extra supplement (confirmation for availability from the hotel is required). These are very spacious, beautifully appointed one bedroom suites. The whole standard of the interior decoration and their size make these suites very luxurious. They feature a dining facility for four or five people and jacuzzis. All suites open to a large veranda and command a magnificent view of the sea and the sub-tropical gardens. Spacious rooms, located in the prime position of the hotel offering a magnificent view to the Mediterranean sea from large balconies. Luxurious decoration in the bedroom and enlarged bathrooms, complete the image of this superb accommodation. The Annabelle excels in the quality and variety of its cuisine. Fresh products, inspired menus and acclaimed chefs ensure that each of the four restaurants provides a unique culinary experience. The hotel's impressive wine list offers everything from the delicate regional wines of Cyprus, to the finest international vintages. With its intimate candlelit tables looking down over delightful illuminated water gardens, The Asteras restaurant offers an innovative fusion gastronomic experience. The Amorosa entices with a menu of contemporary continental cuisine, while The Fontana offers a choice of buffet or Ã la carte dishes in a relaxed, family atmosphere. Not to be missed is the Mediterraneo Restaurant where Executive chef Polycarpos Demetriou prepares traditional Mediterranean Cypriot dishes. 'Food from the Village', a cook book, compiled by the acclaimed writer and broadcaster Thane Prince containing recipes for many of these Mediterranean classics is available. Driving through vineyards and orange groves, you will come to Polis, a small rural village on the sea, on the North West coast. Turning westward you will come to the Baths of Aphrodite. This area, like the whole of Paphos, is full of legends, most of them with Aphrodite and beauty as the center theme. The landscape in the area is very pleasant and by looking around you have the feeling that the area is distinctly different from the other parts of the island. The sea is crystal clear - why not take a swim in the same waters that Aphrodite used to bathe? The fortress is situated on the hill overlooking the harbor and was built in the 3rd century A.D., in order to protect the harbour from Arab invasions. It was one of the fortresses handed to Richard the Lionheart and was destroyed by earthquakes in 1222 A.D. Proceeding further towards Limassol, one finds Curium Theater, a Roman theater (50 - 175 A.D.) sitting on the edge of a cliff and overlooking the sea. The auditorium can seat about 2,400 persons. It is now used for concerts or performances of Greek drama and Shakespearean plays. This is the place where old Paphos was built and it is the site of the Temple of Aphrodite, a most popular place of worship in the ancient Greek world. The foundations of Palaepaphos go back to the Mycenean period (1250 BC) with Kinyras as the founder. This is a small medieval castel situated on the western side of the harbor and was erected for the protection of the harbor. It was built by the Luzinians and was connected to the walls which surround the town. The castle was destroyed by the Venetians and was rebuilt by the Ottomans. This lovely monastery is situated in an area with beautiful pine trees, 3,770 feet above sea level and was founded in 1152 A.D. Not far away from the Monastery is Ayia Moni, where there is a nice village coffee shop, where you can stop for a drink or a snack. The view of Paphos from there is magnificent. This is the largest and most famous Monastery in Cyprus. It is built on a mountain full of pine trees, 3,800 feet above sea level and was founded in 1100 A.D., in the reign of the Byzantine Emperor, Alexios Komninos, who presented the Monastery with an Icon of the Virgin Mary and Child, believed by some to have been painted by St. Luke. On the way to Kykko one drives through the Cedar valley which is quite a long drive, but very enjoyable. One can proceed from Kykko to Pedhoulas, Prodromos, Troodos, Platres, Limassol, and then return to Paphos - the whole journey takes about four hours. The Monastery is built on the mountains from where one enjoys superb views of Paphos and the seashore. The Monastery was established by Neophytos, a Cypriot from Lefkara ( the village famous for its embroidery) who followed the monastic life. He carved a church into the hard rock, the surface of which was covered with fresco paintings. The Monastery next to it is also of great interest and has some unique icons, examples of Byzantine art. There is also a workshop where a trained Monk repairs old icons and documents. A white rock or rather a complex of rocks, known as Petra tou Romiou stand in the white foam of the blue sea. This is the place where according to legend, Aphrodite came out to the sea and is a magnificent setting that makes everyone passing stop and admire. Some take a swim in the hope that a new Aphroddite will come. This village is known for a special kind of weaving which is done on hand looms. The technique and designs are unique and whereas you will find weaving in other parts of the island, Phiti's designs and technique stand on their own. This is situated on top of the hill between the harbor and the lighthouse and its floor is covered with famous mosiacs. The House of Dionysos was bombed by Turkish planes during the invasion but, fortuntely, the mosaics were restored. This in on the road to Limassol and was the religious center of Curium in the Archiac period (7th century B.C.) founded by people from Argos in the Peloponnese. There are the ruins of two temples dedicated to Apollo and the buildings were destroyed by an earthquake in 350 A.D. This beautiful church sits high on a rock, seen from everywhere, and was saved from the attacks of the Saracens. The Saracens attacked the old town of Paphos several times, for the purpose of looting, especially stripping the churches of their treasures. Yet, Theoskepasti was saved because, according to legend, everytime the Saracens came close, a thick divine cloud would descend and cover the church and thus, the Saracens lost sight of it. Apostle Paul visited Kato Paphos on his first missionary journey in 45 A.D. Here Sergius Paulus, the Roman Governor of the island, heard the word and became a Christian: thus, Cyprus was the first country in the world to have a Christian Govenor. According to legend Apostle Paul was tied on the pillar and was given "fourty one lashes." Off the main road, towards the town of Paphos and near the sea, one can visit the Tombs of the Kings. Actually the tombs were not for kings but were so called because of the imposing design. The tombs are carved into rock, there is a court with pillars and around it lie the tombs. The pillars are of Doric design and the tombs beloing to the 3rd century B.C. Paphos is generally known as the big garden of Cyprus for fruit and early vegetables. However, if one wishes to see and enjoy grapes, one must vistit Sraoumbi and Polemi villages (about 20 mintues drive). Here you will see vineyards with seedless grapes and grapes for making wine. If the grapes are in season and you see an owner, stop, he will be glad to offer you as many grapes as you can eat. This area is well known for village wine. Paphos town is the center of the Paphos district and as such, it is the center of a traditionally agricultural vicinity. In Paphos you may visit the small but interesting Museum. The area with the schools and the Municipal Hall, built in the Hellenistic Style, is also quite interesting. The shopping area is on a main street which leads to the Market. The name of this village means Hieros-Kipos or sacred garden of Aphrodite. In Yeroskipou you can visit the church of Ayia Paraskevi. This is a Byzantine church, built in cruciform style with five domes and a small chapel in its south-east corner. There are very fine frescos as well as icons of the 15th century. No stay at 'The Annabelle' is complete without a visit to The Andromeda Health and Beauty Centre, whether your idea of relaxing is an energetic work out in the gym or a pampering beauty treatment, The Andromeda Health and Beauty Centre provides the perfect solution. 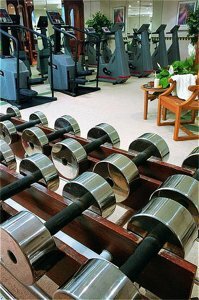 The Health Centre offers a fully equipped gym where physiotherapist will be happy to help devise your fitness programme. Or for absolute self-indulgence, unwind in the privacy of a whirlpool, steambath or sauna. The Andromeda Health and Beauty Centre is also an Aveda Spa and uses Aveda products in many treatments. The Annabelle offers a full range of watersports, such as windsurfing, water-skiing and scuba diving. 'The Annabelle' also offers a special 'Learn to Scuba Dive Package', starting with an introductory lesson advancing to supervised dives in the sea. The hotel also offers a private beach and a tennis court with floodlight. All year golfing becomes a reality in Cyprus at the superb 18-hole championship, par 72 Tsada Golf Club, located just 14 kilometres from 'The Annabelle', with stunning views matched by first-class facilities. Bathed in the warmth of the Mediterranean sunshine, Tsada offers golfing enthusiasts the opportunity to play in winter and summer alike. For those who relish variety, there is also the Secret Valley Golf Course. Situated at Petra Tou Romiou, 18 kilometres from Paphos, the 18-hole course plays to a par 72 and measures over 6,300 metres. Clubhouse facilities include a large chipping area, a driving range and video coaching for improved technique. 'The Annabelle' offers 5 meeting rooms with latest conference technology for up to 400 people. The Athenaeum Ballroom offer a graceful ambience for a glittering ball, a presentation, an anniversary, a wedding, a concert or a fashion show. The Salle Armonia is perfect for conferences and Gala Dinners and can be divided into two separate rooms.